When you buy something in pairs (sometimes trios if you count travel sizes), keep backups in your beauty cabinet and stash one in your boyfriend’s cupboard just in case, you know you’ve happened upon something good. It is without a doubt that Josh Rosebrook’s Hydrating Accelerator is a holy grail moisturizing toner in my collection. I can’t get enough of it, recommend it to everyone who emails me looking for skincare tips and will soon have listed it on my highly edited “faves” page. If you’re unfamiliar with Josh or his line, know that it’s a carefully curated collection that pleases both men and women thanks to its minimalist packaging and unisex scents. I’ve tried and reviewed the bulk of his products and respect the man’s approach to formulating (the herbs, oh the herbs!) as well as his humble, genuine demeanor. Find authentic formulators, and you’ll find authentic formulations! But of everything in his growing yet true-to-his-values skincare line, nothing pleases me more than Hydrating Accelerator. I’ve been using it for a year now, first purchasing it from the man himself at “A Night for Green Beauty” in Los Angeles in 2014. First, let’s talk functionality: Josh Rosebrook’s Hydrating Accelerator is packaged in the most fantastic plastic spritz bottle ever. Yes, that’s right. I said fantastic plastic. I don’t care how many fancy violet or amber glasses are collecting on your top shelf — this off-white, easily recyclable No. 1 plastic bottle is the bomb, and if Josh ever changes the packaging, I am going to panic funnel my toner into an old bottle instead. What makes the packaging so amazing is the way the spray nozzle is made. With one press, you get the most perfect, fine, even mist. There’s no targeted stream that messes with your makeup or deposits too much product onto one spot. That’s extremely difficult to find with the popular violet glass spray bottles available today. Next, let’s talk scent: Imagine a soft dessert of marshmallow and vanilla that gently satisfies your cravings. Then add a touch of delicate ylang ylang and calendula to balance out the sweetness with some edible flowers. Drooling yet? I catch myself every time I spritz this creation onto my face (which, well, is throughout the entire day — forgot to mention that I also keep this on my desk at work!). Now, onto ingredients: In true Josh Rosebrook fashion, he’s combined his signature organic herbal infusions and oils with soothing aloe vera-infused water to drench your skin in the most active nutrients, essentially quenching its thirst from the outside in (while on the inside, you better be drinking water every couple hours throughout the day to maintain that glow!). Josh Rosebrook’s Hydrating Accelerator is the most calming, soothing facial mist I’ve ever used, helping to heal my skin from dryness, itchiness and flakiness while gently preparing it for deeper hydration from serums and oils. Its rich antioxidant and fatty acid content work in concert with the skin’s naturally protective acid mantle, keeping it safe from the elements. OK, so what exactly do you do with this thing again? I get this question a lot, mostly from non-beauty junkies who read about all the crazy skincare products out there and don’t really “get” the concept behind toners, mists, hydrosols and the like (and who can blame them — there are so many damn names for these, basically, vitamin- and herb-infused liquids!). 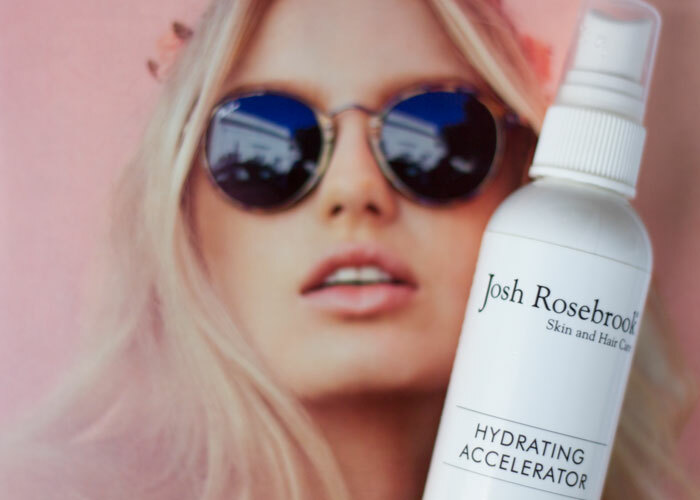 Josh Rosebrook’s Hydrating Accelerator is a moisturizing toner that’s best used to prep the skin for layering skincare products as well as for refreshing the skin throughout the day. After cleansing in the morning, pat your face dry and then spritz your entire face with three to five pumps of Hydrating Accelerator. While your skin is still damp from the spray, apply a layer of your favorite serum and then finish off with a moisturizing face cream or face oil. A damp face pre-moisturizer application is key to helping the product penetrate as deeply as possible, especially if you’re using an oil instead of a water-based cream. Hydrating Accelerator, which is already loaded with moisture, is only going to add that much more! Throughout the day, mist your face with Hydrating Accelerator to keep your makeup from looking dry or cakey and to also refresh your skin, giving you that beautiful glow even under the unflattering fluorescent lights of your office. Antibacterial Bilberry and neem gently tighten and tone the skin. Fennel seed fights inflammation and firms the skin. Marshmallow root helps brighten dull skin. Antioxidant-rich calendula, slippery elm and skullcap protect and balance the skin. Chickweed, hawthorn berry and green tea activate healing thanks to their powerful antioxidant and vitamin content. Coconut and grapeseed deliver essential fatty acids and vitamins to balance and strengthen the skin’s natural acid mantle. Organic vitamin-infused aloe water preps skin for deep hydration. It’s products like these that re-energize me to blog. When I’m this damn smitten with a product, I want to shout it from the rooftops (but kinda also don’t want to tell anyone for fear of it selling out and fear of my three bottles in reserve not getting me through to the next restock). I hope you’ve enjoyed this fangirl post and will get to know Josh’s line a little more. But if you haven’t, that’s cool. More Hydrating Accelerator for me. No, I’m not paid to shill for Josh. Hell, Josh didn’t even know I was writing this post until I tagged him on social media today! And that’s the way I like it. Surprise! I love you. But you already knew that. What is your holy grail toner? What products do you buy in bulk? Have you tried anything from Josh’s line? Tell me in the comments section!